What is Europe going to do about Islam? Submit? Resist? Or just wait it out, dimwittedly? The recent French presidential election offers insight into the way Islam, or more exactly the Islamist factor, may eventually play out in European politics. Despite attempts by the Left to focus the debate on the economic crisis, Islam played a decisive role in the contest. The Socialist candidate, whose platform was tilted to favor the party's Muslim clientele, could not have won without total support in the second round of voting from far Left parties marked by zealous anti-Zionism and a full range of anti-Western ideologies. The question of Islam-in-France was raised with unprecedented candor by incumbent Nicolas Sarkozy of the Movement for a Popular Majority (UMP). For the first time in France, a major party clearly advocated a push back against Islam (qualified of course with the adjective "radical"). This strategy fired up the enthusiasm of the base, mobilized voters, brought tens of thousands to party rallies, and led to a daily increase in Sarkozy's polling figures. It would be fair to estimate that if he had had one more week to campaign he might have defeated Hollande during the second-round vote on May 6, 2012. But his momentum had already been slowed by Marine Le Pen, candidate of a refurbished Front National. During the first-round campaign of April 9-22, the media kept its spotlight on her in a replay of the strategy used by the last Socialist president, François Mitterrand, who deployed them to exaggerate her father Jean-Marie Le Pen's importance and weaken the conservative opposition. While accusing the Right of dallying with the Front National "fascists," Mitterrand had unashamedly governed with a coalition of communists and the far Left without which the Socialists could never have won. A variation on this strategy was used in 2012: Anyone who dared question the virtues of "immigration" (code word for Islam) or defend national identity (code word for Islamexasperation) was smeared with pejoratives, all related to Nazism and the Holocaust. 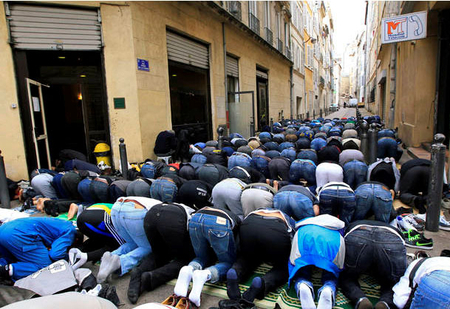 French exasperation with Islam is prompted by situations such as this where Muslims illegally take over streets in Paris in order to pray. Authorities look the other way while the French are left wondering what has happened to their country. In fact, this worked to the advantage of Le Pen, who came in third with 17.9 percent of the vote in the first round. What explains her pulling power? Did millions of French voters, disappointed with Sarkozy's failure to release the pent up energies of the French economy, go for the Front National's unrealistic economic program? Or did they, like the more vocal counter-jihad activists who rushed into her arms, simply ignore it and focus strictly on her championing of Islamexasperation? The activists, blaming Sarkozy for being big on rhetoric but soft on Islam, placed their faith in Le Pen, who came out beating the drum against Muslim street prayers ("an invasion without tanks") and marched forward, stressing all the issues about which they themselves were blogging. They believed she would put an end to shameful compromises by the Right and the Left, which they designated by the composite "UMPS" (UMP + PS [Parti socialiste]). Enchanted by her tough-on-Islam rhetoric, the new enthusiasts ignored the core of small-minded, retrograde anticapitalist—and often anti-Semitic—Front National stalwarts. Members of the "Jews-for-Marine" faction gave credibility to her clumsy visits to the United States and Israel. Her secularist Jewish supporters hardly noticed the way she lumped Judaism together with Islam, willing to sacrifice kosher slaughter if Islamic halal could be abolished along with it. They did not even hear her declare that the U.N. Security Council should recognize Palestine. Heady with power after her good first round showing, Le Pen orchestrated the defeat of Sarkozy by convincing half of her supporters to cast a blank ballot in the second round of voting. Bloggers and activists associated with the counter-jihad site, Riposte Laïque, believed that the UMP, condemned for its failure to stop the Islamic onslaught, would fall apart, and Le Pen would pick up the pieces. Confident that a slew of deputies would be elected in a Front National wave, they said she would be the leader of a new conservative party and, in 2017, why not Présidente de la République? There is one category of the indigenous European population that is clearly persecuted by Muslim immigration: the Jews. Not all Muslims attack Jews but virtually all anti-Jewish violence in France is committed by Muslims. And it is so widespread, so merciless, so stubbornly resistant that thousands of Jews have chosen to emigrate. Of those who remain, many valiantly devote their energies to denouncing the violence and trying to defend Jews against it. But no less shocking than the flight or fight choice imposed on Jews is the general indifference to their dilemma. The expulsion of a few illegal immigrants can monopolize prime time news for days while most attacks against Jews are ignored by the national media. Those that are reported are twisted out of shape by fabricated ambiguity. The victim says he was beaten/knocked down/kicked/slashed/bombarded with anti-Semitic insults. The perpetrator denies the insults. The journalist gives equal credibility to the Jew-basher and the bashed Jew, and the story quickly drops out of sight. On the rare occasion when an anti-Semitic crime is too big to ignore, it is drowned in a flood of emotion: Solemn public figures in skull caps attend synagogue ceremonies, Jewish community leaders and intellectuals publicly agonize in the media, and minutes of silence and solemn marches are organized. But the connection between Islam, Jew hatred, the specific killer, and the criminal act is severed. This was the case with the murder of Sébastien Selam by a Muslim neighbor in 2003 and the kidnap-torture murder of Ilan Halimi by an Islamist gang in 2006. Islamism's brutal face showed up once again on the eve of the official presidential campaign in the form of Muhammad Merah, who assassinated three paratroopers of fellow North African origin—Abel Chennouf, Imad Iban Ziaten, and Muhammad Legouade—and then on March 19, executed Rabbi Jonathan Sandler, his sons Aryeh and Gavriel, and 7-year-old Miriam Monsonego at the Ozar Hatorah school in Toulouse. A surviving soldier, Loic Liber, is a tetraplegic while student Bryan Aaron Bajoui is recuperating from critical chest wounds and the shock of witnessing the murders. Because Merah killed both Jews and apparent Muslims (in fact one of his Maghrebi victims was Christian), the crime could not be termed as purely anti-Semitic. The fact that he was a run-of-the-mill punk rather than a wildly deranged one-of-a-kind killer raised no alarms in the public mind: Ominously, a striking increase in attacks against Jews following Merah's jihadist operation showed that a very broad swath of the French Muslim population is both radicalized and activated. This does not mean that French society was not shaken by the Merah massacre. The weekly Nouvel Observateur featured a cover story on anti-Semitism in July. Yet, the lead article by Isabelle Monnin, "Journey to the Depths of Anti-Semitism," meanders with half-closed eyes down the path of the new anti-Semitism. Merah is identified as a jihadist admired by a "small minority." Several attacks against Jews are described. (Attacked by whom?) Jews who wear skull caps are afraid to go into certain neighborhoods. (What kind of neighborhoods?) Most incidents, it seems, are not violent enough to be worth reporting. Others—in Villurbane, a North African bashed a young Jew's head with a hammer—are admittedly serious but, writes Monnin, they are whipped up by bloggers, leading to a "paranoid trend that makes every attack on a Jew the absolute proof of rampant anti-Semitism." Finally, Monnin identifies the Jew-bashers when she states that "today's anti-Semitism is often [sic] committed by youths of Maghrebi origin or sub-Saharan Africa calling themselves Muslims." Are they not really Muslims? Or does the author think they do not represent true Islam? She attributes this anti-Semitism to a "political-religious molasses transposed from the Israel-Palestine conflict and anti-Americanism." But, she alerts her readers to watch out for "a certain number of Jews whose racism and Islamophobia is reinforced by the increase in anti-Semitism." This blaming of the victim is repeated in other articles of the special issue, which accuse Jews of exaggerating the situation while exonerating Islam of anti-Jewish animosity. Journalist Marie Lemonnier begins her piece with a statement by the prominent Muslim Brotherhood cleric, Yusuf Qaradawi, hoping the Muslims will follow in Hitler's footsteps and perfect the next holocaust. Yet after admitting that "extremists" like Qaradawi draw their legitimacy from Muslim tradition, she goes on to deny the evidence: The anti-Judaism of Islam's beginnings is just the "traditional" way that religions differentiate themselves. She cites specialists who tell us that Jews and Muslims lived harmoniously together for fourteen centuries, ignoring massive documentary evidence to the contrary. Forced conversions during the Almohad period, she says, were an exception to the "imperishable" Qur'anic verse: "Let there be no compulsion in religion [Surat al-Baqara, 256]." Anti-Semitism in Muslim lands was tragically imported from Christian Europe. And, she concludes, "in the wake of decolonization and Israeli-Arab wars, Jewish presence in Islamic lands became rare." If by chance Jewish presence in France were to become rare, would it be equally passive? While Le Pen immediately cited Merah's crime as proof of the connection between immigration, Islam, and violence, the media narrative was framed to disconnect Islam from this murderous hatred though the terms "jihad" and "jihadist" were widely employed, and the media did include information about Merah's radicalization. In the ensuing election campaign, the Socialists opted for the deprivation/marginalization explanation while Sarkozy proposed legislation that would criminalize radicalization—for example, training in Pakistani jihad camps—making it possible to arrest men like Merah before they go into action. But the issue of Islam's coexistence with Western society and its values was allocated to the Front National. Every time the UMP raised the question, it was accused by the Socialists, the media, and some of its own members of appealing to the public's worst instincts, sucking up to Le Pen's supporters, and stoking irrational fears, xenophobia, and "Islamophobia." At the opposite end of the spectrum, counter-jihad militants dismissed Sarkozy's "empty rhetoric" and tallied up his sins of past concessions to Islam. In fact, Le Pen had neither the political savvy nor the party machine to capitalize on her first-round success. In ensuing legislative elections, she was defeated in her bid for reelection as deputy of the town of Hénin-Beaumont by her arch rival, the leftist Front de Gauche presidential candidate Jean-Luc Mélenchon. The Front National ended up with a grand total of two deputies in parliament: Marion Maréchal-Le Pen, Marine's 20-year-old niece, and lawyer Gilbert Collard (who is not even a card-carrying party member). No longer useful for the Left's divide and conquer strategy, Marine Le Pen and her meager band of supporters disappeared from the media. Faced with a choice between a muted appeal to the Center and a resolute attempt to consolidate his right-wing base and win back Front National voters, Sarkozy chose the latter line of attack. Accused by Left and Center of selling his soul to the Front National devil, the battling incumbent rose to the height of his political skills and attracted an increasingly enthusiastic following. His defense of family values, the work ethic, and patriotism were equated by his detractors with the infamous "travail, famille, patrie" of Maréchal Petain. His concern for decent people in poor neighborhoods victimized by thugs was met with contempt and cries of "populism." They called him a xenophobe for linking immigration with criminality, abuse of social services, and a damaged school system. His warnings against the dangers of Islamic radicalization earned him the "Islamophobe" label. In the counter-jihad camp, voters closed their ears to his siren's song. He did not deliver when he was Interior minister; he did nothing when he was president; we don't want to hear it! In the course of a three-hour presidential debate on May 2, 2011, the candidates had a fiery exchange on the subject of the Socialist candidate's promise to grant voting rights to foreigners in municipal elections. With the brutal Ozar Hatorah murders still alive in the collective mind, Sarkozy said this would encourage communautarisme (clannishness, tribalism, identity politics) at a time of extreme tension "between communities" and intense pressure for radicalization. A righteously indignant Hollande snapped back: What gives you the right to say that non-European immigrants are Muslim? Sarkozy responded at length and in detail, challenging his opponent to face the reality that immigration is essentially from Muslim countries of the Maghreb and sub-Saharan Africa. These immigrants, he said, were the source of conflict. If they voted in municipal elections they would make demands based on Islamic practices. Reiterating his hallmark call for an "Islam of France" not an "Islam in France" and citing his own record of defending the religious freedom of Muslims, Sarkozy noted that Muslims were treated better in France than Christians in the Muslim world. Hollande, rebuffing the slightest insinuation that Muslim voters would exert communitarian pressure, promised there would be no breach of the principle of laïcité (the relegation of religion to the private sphere) under his presidency. When it came time for the second round of voting, Mélenchon's Front de Gauche supporters along with the Green Party and a smattering of anti-capitalist formations, high on ferocious Palestinianism, cast their votes for Hollande, making no secret of their utter disagreement with his platform. Hollande's campaign manager, Pierre Moscovici, assured his fellow Jews that Hollande would indeed cultivate the votes of these somewhat unsavory parties, but they would have no influence whatsoever on his policies as president. The proliferation of flags from Muslim-majority countries at Hollande's victory celebration was graphic evidence of this support. Apologists explained away the foreign flag waving as the normally variegated enthusiasm of diversity. But a television team interviewed some Palestinian-flag wavers who repeated new variants on old canards (e.g., Israeli soldiers mow down Palestinian children on their way to the mosque), promising to head over there and kill all the Israelis. What transformed the predicted landslide defeat of Nicolas Sarkozy into a narrow victory for François Hollande (51.67 vs. 48.3 percent)? Though the totality of the far Left vote, including an estimated 93 percent of the Muslim vote, went to François Hollande, this alone would not have ensured his victory. It seems clear that Sarkozy limited Hollande's numbers by addressing the Islamexasperation of his party's base. The loss of a significant portion of this "counter-jihad" vote, diverted in the beginning to the Front National, blocked Sarkozy's momentum in the first round and deprived him of decisive votes in the second. This was compounded by the desertion of morally indignant centrists who accused the president of leading his party into the disgraceful clutches of the far Right. The elections are over, but the debate continues, not only within the UMP, as it determines its policy of reconquest, but also within the Socialist government, confronted with a problem that will not go away. For Jews in France, the issue is stated with terrible acuity: The future of their community in the country—as in the rest of Europe—depends on the government's capacity to identify and deal with this problem. The Islamic factor will not go away. This summer, punk jihadists on the warpath caused a million Euros of damage in the housing projects of Amiens; thugs fired at police in Grigny; drug dealers are mowing each other down in the streets of Marseille; teachers are getting insurance coverage for injuries inflicted by students or their parents after a teacher in Bordeaux was beaten by a student offended by a history of religion lesson on Islam. Jean François Copé is competing with former prime minister François Fillon for the presidency of the UMP on a platform that carries over Sarkozy's campaign themes. He has vowed to defend a party that will confront the issues without political correctness, defend law-abiding citizens against criminals, and promote enterprise, innovation, and self-reliance. But neither he nor any of the other candidates, parties, or elected officials are up for an unambiguous confrontation with Islam. When Jamel Ghabi, a French elected official was nearly killed by a group of Salafis in Bizerte, his Tunisian birthplace, because of the "immodest" dress of his wife and 12-year-old daughter, Copé decried the attack by "extremists" who have nothing to do with a religion and a society moving toward democracy. Interior Minister Manuel Vals vowed to bring law and order to Marseille without stigmatizing the population while Minister of Foreign Affairs Laurent Fabius balanced out strong words against Iran's president Ahmadinejad with a reminder that the Israelis should give the Palestinians a state. The economic crises of modern days may come and go, but the survival of civilization depends on intelligent decisions by informed citizens and courageous statesmen. The 9/11 anniversary murder of Ambassador Christopher Stevens and his colleagues by Libyan jihadists, along with attacks on Western embassies and institutions throughout Muslim-majority countries are alarm bells for those who are willing to listen. The Israeli ambassador to Egypt has been working in temporary quarters since the embassy was torched last year. All other issues pale beside the existential triangle: Islam, Israel, and Iran. Will Israel, the only Western nation in which the governing party is resolutely counter-jihad, lead the free world into a new strategy of resolute self-defense and preemptive operations? Which side of the chessboard will the newly-elected U.S. administration choose? And finally: Whither France? Nidra Poller is an American novelist and journalist living in Paris since 1972. The English version of her collection of short stories, Karimi Hotel and Other African Equations, will be published by Authorship Intl in 2013. Author interviews with anonymous supporters of Le Pen, Paris, Apr.-May 2012. Riposte Laïque website, Chanteloup-les-Vignes, Sept. 10, 2012. Michel Gurfinkiel, "French Jews/No Future," MichelGurfinkiel.com, Aug. 12, 2012. See, for example, Les Dernières Nouvelles d'Alsace, Apr. 30, 2010; The New York Sun, Feb. 22, 2006. Algemeiner Journal (Brooklyn), Mar. 19, 2012. "Alerte Actes Antisémite," Service de Protection de la Communauté Juive en France, accessed Oct. 9, 2012. Paul B. Fenton and David G. Littman, L'Exil au Maghreb (Paris: PU Paris-Sorbonne, 2010). Le Nouvel Observateur (Paris), July 5-11, 2012. The Guardian (London), May 10, 2002. "Débat Hollande Sarkozy Intégral," The Daily Motion (Paris), accessed Sept. 28, 2012. Nidra Poller, "Toward an 'Islam de France,'" The Wall Street Journal Europe, Mar. 28, 2011. Pierre Moscovici, presentation at a meeting of the Conseil Représentatif des Institutions juives de France, l'espace Rachi, Paris, Apr. 2, 2012. Khoutspa TV (Paris), May 6, 2012. BBC News, May 3, 2012; The Guardian, May 3, 2011.
 Business Insider International (New York), May 8, 2012. Le Figaro (Paris), Sept. 13, 2012. Le Monde (Paris), Sept. 6, 2012. News release, Union pour un Movement Populaire, Aug. 23, 2012. Laurent Fabius, interview, Consulate General of France in New York, accessed Oct. 9, 2012. Related Topics: Muslims in Europe | Nidra Poller | Winter 2013 MEQ receive the latest by email: subscribe to the free mef mailing list This text may be reposted or forwarded so long as it is presented as an integral whole with complete and accurate information provided about its author, date, place of publication, and original URL.